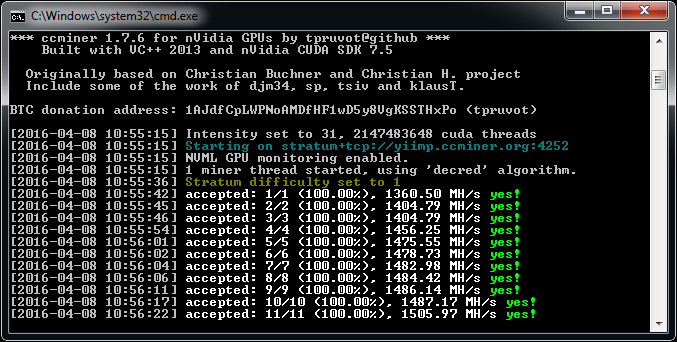 Another update with a new Windows binary compiled from the latest ccMiner 1.7.6-git fork from tpruvot (source) with fixes that make the Decred (DCR) performance improvements by pallas work properly under Windows as well as Linux. The release below includes two versions of ccMiner, one is 32-bit binary for Windows that is compiled with CUDA 7.5 and with support for Compute 2.0 or newer Nvidia GPUs, and another that is 64-bit Windows binary compiled with CUDA 7.5 for Compute 3.5 or newer Nvidia GPUs. 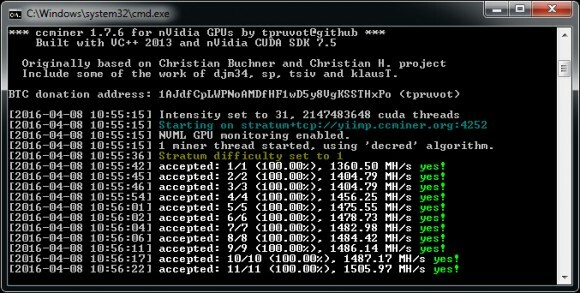 Do note that if you have a newer Nvidia video card you should use the 64-bit CUDA 7.5 release as it is providing slightly better hashrate than the 32-bit CUDA 7.5 binary.